Gaming is the first word that comes to mind when you think of virtual reality glasses. It’s not necessarily wrong to associate VR with video games, given that virtual reality has really brought new life to the gaming industry, but it is equally important to acknowledge that this type of technology can be used successfully in other fields as well. Although it’s not utilized extensively yet, business people are starting to realize how their businesses could profit from the use of virtual reality technology. At the very least VR glasses can perform many of the functions computers have, which is already a huge advantage for the person wearing them, as it leaves their hands free for other activities. But the benefits of VR technology go far beyond this. Holograms make it easier for people involved in the creation and design of various products to visualize what their work will look like and to make the necessary changes. It’s no wonder that the Microsoft Hololens was such a big hit right from the beginning. Gamers had expected its launch for some time and they say it was worth the wait. Even experts think it’s one of the best AR headsets one can currently buy. The product is so popular that even if you tried to find a Microsoft Hololens review that it’s not overall positive it would be impossible. So what are the factors that allowed this headset to become so successful? First of all, it’s the fact that its special design not only guarantees the comfort of the person that wears it, but also keeps much of the light out, thus excluding possible distractions. It still allows users to see their surroundings though. Secondly, it’s quite impressive that both the quality of the sound and the hologram resolution are excellent. These two features work together to create a unique “mixed reality” experience, as Microsoft calls it. Have you had the chance to try out the augmented reality glasses Microsoft has created? If you haven’t, put this on your to-do list right now. The headgear is somewhat similar to the Moverio BT-100 in the sense that it allows you to explore AR features while still keeping contact with the physical world. However, the differences between these two products are much more numerous than the similarities. 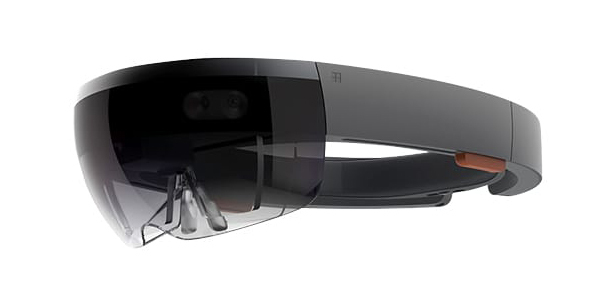 In fact, there are certain characteristics that differentiate Microsoft Hololens from most other AR glasses on the market today. You might be tempted to say that price is the most striking difference, and you would be correct. But Microsoft never intended to create a cheap product; on the contrary, the Hololens was meant to fit in the premium category, and it undoubtedly does due to its remarkable combination of features and elegant design, that doesn’t only look good but is also fully functional.